These two gas companies have moved in opposite directions in recent years. Income investors looking for dividend stocks that provide exposure to midstream and downstream natural gas industries may cast their eye upon Ferrellgas Partners LP (NYSE:FGP) and WGL Holdings (NYSE:WGL). The former is the owner and nationwide distributor of Blue Rhino propane tanks, and it pays out a sizable annual distribution yielding 8.3%. The latter is a holding company with hands in multiple cookie jars spanning natural gas utilities and natural gas storage. Both companies own midstream businesses, but that's about where the comparisons end. In the last three years, these two dividend stocks have performed as mirror images of each other. 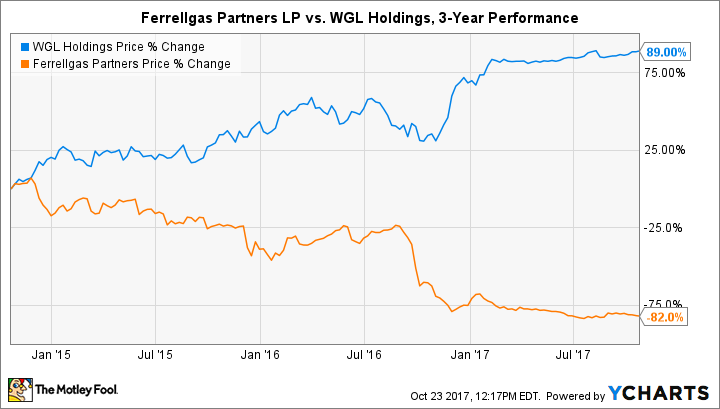 That chart provides a stunning visual comparison that hints at the recent struggles and successes of Ferrellgas Partners and WGL Holdings, but doesn't provide much insight into what lies ahead. If you could only buy one of these stocks, which would be the better buy? Two big events have shaped the respective performance of each stock. Roughly one year ago Ferrellgas Partners slashed its dividend 80% in an effort to redirect cash flow toward steadying the balance sheet. The stock collapsed, and operations have struggled in recent quarters. So, although the current yield of 8.3% is formidable, it's really a sign of the risk involved investing in the company right now. Meanwhile, in January 2017 WGL Holdings announced it had agreed to be acquired by AltaGas of Canada for $6.4 billion. The price tag worked out to $88.25 per share, and after near-unanimous shareholder approval this summer, the deal is set to close in the second quarter of 2018. The acquisition price represents a 3% premium to the current market price. Throw in one or two more quarterly dividend distributions before the merger closes and the total returns may reach 4% or so. That leaves investors with a relatively simple question: is the long-term upside of Ferrellgas Partners stock greater than the 4% upside to WGL Holding stock's acquisition price? Admittedly, that's not a very high bar, but it all depends on whether or not the struggling propane distributor can turn things around. Trading at 47.8 times future earnings is relatively expensive even by historical averages, but even some earnings are better than no earnings, as is currently the case. An enterprise value-to-EBITDA of 12.2 is the lowest since late 2013. A PEG ratio less than 1 suggests that the stock is currently undervalued. Of course, investors shouldn't be too surprised by these valuation metrics considering Ferrellgas Partners stock recently experienced a mass exodus of shareholders. What does the company need to do to successfully execute its turnaround? There have been two primary factors that led the propane distributor to its current state of affairs. First, it made massive investments to jump into midstream operations and diversify revenue. The timing didn't work out. Energy prices dropped and margins collapsed for the midstream segment. That has made it difficult to justify the extra $1 billion in debt taken on to finance the expansion. Second, demand for propane has taken a hit from unusually warm weather. Ferrellgas Partners noted that 2017 was 18% warmer than "normal." The company plans to fight back by selling higher volumes and gaining market share, but that incremental business will come with lower margins. And since "warmer weather than normal" figures to be the new normal, the company may struggle to return to its former greatness. In other words, Ferrellgas Partners is contending with forces mostly out of its control. The midstream segment could still rebound with the rest of the energy market as it has in the last two quarters, especially as American energy exports ramp up, but chipping away at debt will take time. Meanwhile, the propane distribution business -- the primary segment -- could find it difficult to shoulder the financial burden in the meantime. There's no denying that WGL Holdings owns the stronger business -- and it's not even close. However, because of its pending merger with AltaGas, investors would only see a roughly 4% gain. Unfortunately, the relatively low return doesn't negate the risk posed by investing in Ferrellgas Partners at the moment. There are too many unanswered questions about its turnaround and too many factors outside of management's control. While the annual 8.3% yield is enticing, the stock has lost 18% in the last six months and 10% in the last month, meaning the annual payout doesn't come close to making up for the volatility. For this matchup, it's best for investors to take the moderate gain in WGL Holdings until the second quarter of 2018 or sit this one out altogether.